Foraging on the Portland Trails? Who knew! They took no notice. So I reached out, plucked a fruit, and popped it in my mouth. Not quite ripe, but identifiably raspberry. Foraged on a Portland Trail. It was delicious. I try not to harvest too much from the trails in order to avoid competing with wild animals and birds. Also, if even a large minority of us foraged seriously, the trails would quickly become denuded. So, had the raspberries been ripe, I’d have contented myself with a few bites before moving on. That said, I’ve dried sumac berries to use as a lemony seasoning; and eaten wild strawberries, blackberries, and blueberries as well as raspberries. I’ve also munched baby dandelion leaves; a stalk or two of raw wild asparagus, which tasted like crunchy grass; and the root of a Queen Anne’s lace. The carrot-relative was crisp and bland, with, shall I say, a soupçon of Fore River Trail terroir from dirt that hadn’t been adequately brushed off. Potential crops grow on every trail favored by wild animals and birds – in other words, all of them. Even though many edibles are small, they are often more nutritious than their cultivated equivalent. It’s particularly fun to forage with children, as so many of the plants are their height. Plus, the most interesting conversations ensue, such as what’s inside a rose hip, why grandfather’s dandelion wine is yellow, and why it’s been known to explode. The latter might cause your teenager to remove the ever-present earbuds and listen. Use accompanying chart to start your own foraging adventure. I’ll see you on the far side of the raspberries. A word of caution for beginning trail foragers. Research plants thoroughly or start with a knowledgeable local forager before going out on your own. Some plants have toxic look-a-likes and some can be toxic in their own right if too much is consumed. Looking for more foraging knowledge and inspiration? Aurelia recommends Stalking the Wild Asparagus by Euell Gibbon, naturalist. Daucus carota Root is a carrot relative. *Be careful! This plant has toxic look alikes Spring & early summer. Taraxacum officinale Leaves are excellent in a salad; flower heads are good for wine and jelly. Spring & early summer. Asparagus officinalis Stalk cooked or shaved raw in a salad. Late spring & early summer. Vaccinium angustifolium (among others), Rubus idaeus, Rubus spp. Berries are a trail snack and make delicious jam. Summer. Medeola virginiana Crunchy cucumber-like trail snack. *Be careful! This plant has toxic look alikes! * Summer. Rhus typhina Lemony berries are good in lemonade and dried for a seasoning. Late summer & fall. 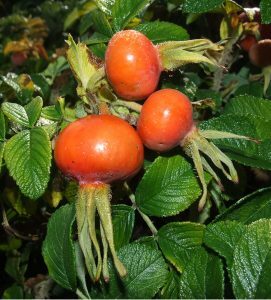 Rosa rugosa, rosa virginiana Rose hips excellent in jelly. Fall. Prunus serotina Berries are a great trail snack. Fall. Sambucus nigra Berries good for wines and cordials. Fall. The University of Maine Cooperative extension has lots of great resources about native plant species and other food plants. Check it out!